In 2015-16, University of Illinois President Timothy Killeen led an initiative to develop a system-wide strategic framework to chart the institution's path to the future and build on the U of I's rich legacy of service to students and to the public good. The development process was a team effort involving all of the U of I's stakeholders. 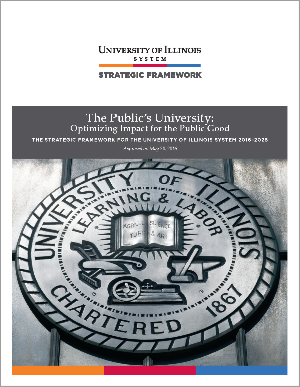 Learn more through the menu on these pages, or download a PDF of the final Strategic Framework for the University of Illinois System 2016 - 2026.